Spacious Modern 2 Bedrooms 2 Bath Apartment in the heart of the city, perfect for families, business travel, and performing artists. The apartment is fully furnished, with large closets in each room, includes in-unit laundry and 1 garage parking space. The kitchen is equipped with gas stove and with many cooking appliances and supplies. The guest can access the roof terrace which offers amazing panorama view of downtown San Francisco with BBQ station. The location is accessible via various transportation, car, bus, BART. It's also along the art and cultural center of San Francisco. Within 2 blocks, we have two movie theaters, Asian Art Museum, SF Main Library, Symphony Hall, SF Ballet and the historical City Hall. To the East, on Polk Street (a block away) is a good place for nightlife, with restaurants and bars. To the West, the Hayes Valley is a hip neighborhood filled with boutique shops, cafés and a neighborhood park, ideal for picnic and stroll. I am an architect working in downtown San Francisco working on high rise buildings. My husband is in tech, connecting people and businesses. We are a perfect combination of the creative and the analytical. We love traveling, food, and meeting new people. 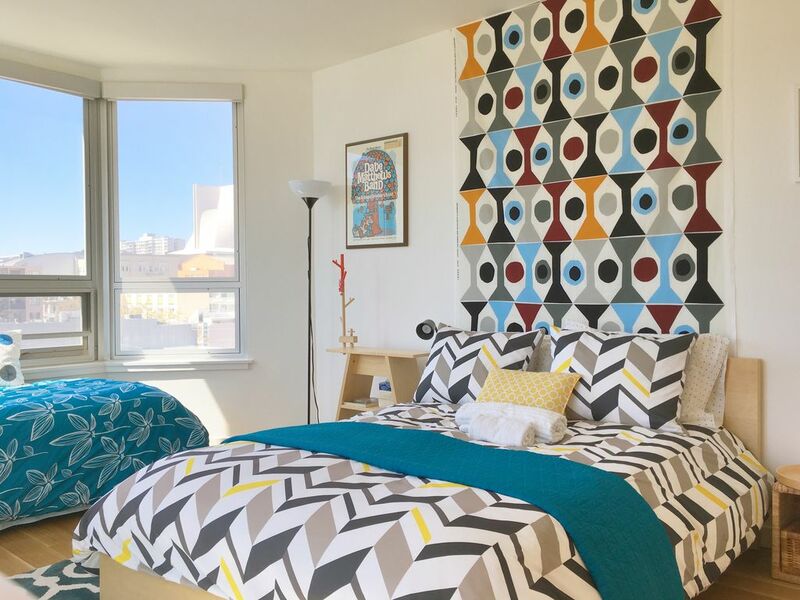 Our modern condo is right on Van Ness Ave. It's accessible via various transportation, car, bus, BART. It's also along the art and cultural center of San Francisco. Within 2 blocks, we have two movie theaters, Asian Art Museum, SF Main Library, Symphony Hall, SF Ballet and the historical City Hall. Both bathrooms are ADA accessible. We LOVED our stay at Wendy Li and Patrick's place. It was absolutely perfect!! We didn't have any problems but Patrick even texted to make sure everything was going okay. We loved the location as it was close to several bus stops and to the train. I believe they do have a parking space available but we were able to use public transportation to get all over the city. The apartment is large. Both bedrooms had so much room and having two bathrooms was wonderful. They apartment was beautifully decorated and very clean. The beds were so comfortable. TV set up was good, no problems with WIFI and there was even an X box available for the kids. Showers were great. It was wonderful having a washer/dryer in the unit as well. The kitchen was one of my favorite parts. It was FULLY stocked with everything you might need for cooking. Most rental kitchens have the bare minimum. I appreciated that this kitchen even had salt, pepper, EVOO, soy sauce--made the bit of cooking we did easier as we didn't have to purchase those staples. The building is VERY secure and we never felt unsafe. There is a coffee show on the main level of the building and both CVS and Walgreens are just a few steps away. We hope to be able to stay in this lovely apartment again soon!